Over the last few weeks, the Boulder County Sheriff’s Office and adjacent Law Enforcement jurisdictions have seen a spike in vehicle trespasses at trail head parking areas. Boulder Canyon (multiple trespasses) and Hall Ranch (one trespass) are two areas where we have had some trespasses. Windows are broken, items left inside the vehicles are taken (purses, computers, electronics, any other valuables). Since Hall ranch is in our back yard, I am asking residents to also make sure that if they go out to any trailhead to not take valuables and to lock your vehicles. Please also lock your vehicles and houses when you are gone from your house or sleeping at night. There has also been more fraud reports as well. Folks, if you do not know the person who is communicating with you (phone, computer, …) in any way and they either want to send you money, ask for money, give you services in return for money or anything that seems too good to be true, do not engage with them. There is “a” computer scam in which people who are on line on their computer get a screen alert from “Microsoft” stating “do not turn off your computer or it will crash” and to call “855-837-9965”. There has also been a person impersonating a “Lt.” from the Boulder County Sheriff’s Office who is stating that they have a court date that they missed and that in order to not go to jail on a warrant, that they need to pay money. The Sheriff’s Office does not make calls of the sort and these instances should all be reported to the Sheriff’s Office. This April marks the Town's 125th year, or quasquicentennial, of incorporation. To celebrate, Town Officials are hosting a commemorative event on April 4, beginning at 5:30 p.m., at Lyons Town Hall. 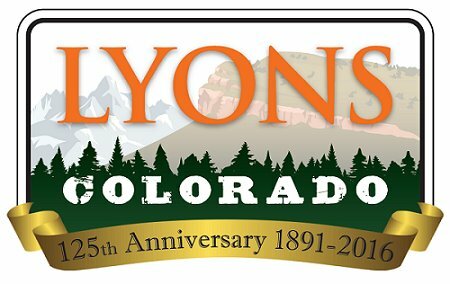 The events will include opening live music, tours of the Lyons Depot, speeches from Mayor O’Brien and Mayor Pro Tem Sullivan, history and poem readings, presentations of commemorative gifts, and more. Community Well-Being - Locally owned businesses build strong neighborhoods by sustaining communities, linking neighbors, and by contributing more to local causes. Keep Money Local - Sales taxes fund our communities and provide vital services such as police and fire protection, street repairs and trash collection. Protect Local Character and Prosperity - By choosing to support locally owned businesses, you help maintain the community's diversity and distinctive flavor. The Town thanks you for your continuous support of our local businesses! Senior's Night Out & happy hour at the Ax & Oar. 10% discount on all menu food and drinks. Visit Lyons Longevity Facebook for more information. A Land Made from Water chronicles how the appropriation and development of water and riparian resources in Colorado changed the face of the Front Range—an area that was once a desert and is now an irrigated oasis suitable for the habitation and support of millions of people. This comprehensive history of human intervention in the Boulder Creek and Lefthand Creek valleys explores the complex interactions between environmental and historical factors to show how thoroughly the environment along the Front Range is a product of human influence.